FeastHome – Are you dreaming about having a unique kitchen that can be the center of attention in your house? Then, you may consider a futuristic style kitchen. A futuristic style kitchen is also suitable for you who want a modern look in your kitchen. 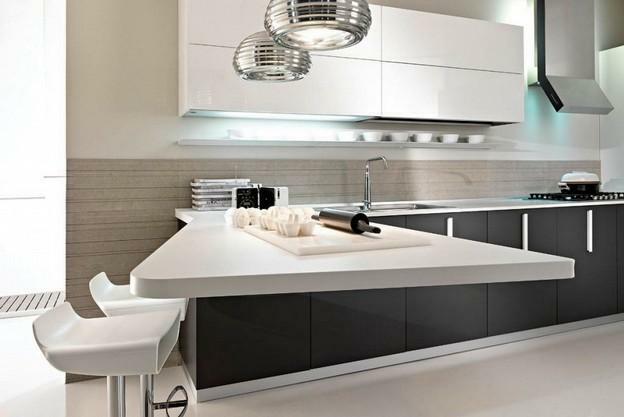 This kind of kitchen is usually related to silver color since this color represents the futuristic style. 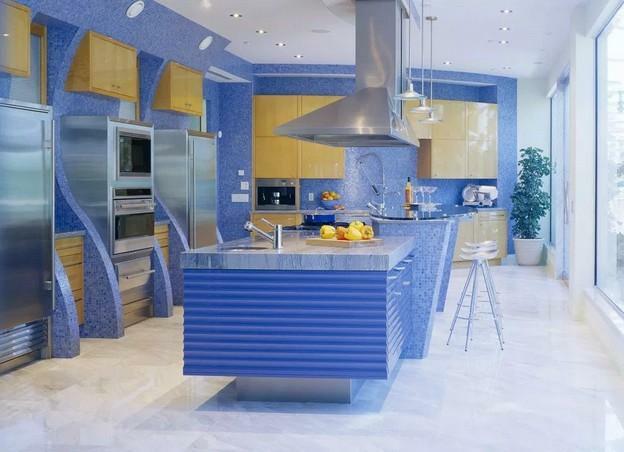 But you can also use other colors to create a futuristic kitchen. 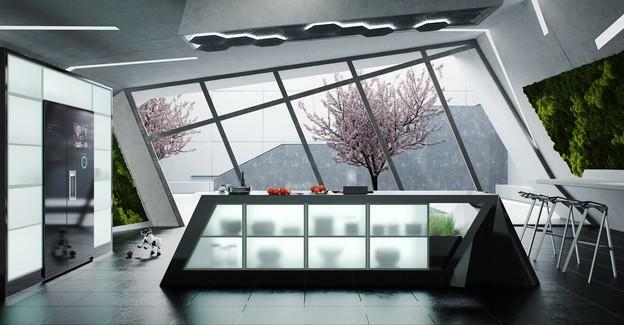 Here are some ideas about a futuristic style kitchen. This futuristic kitchen looks very unique because of the asymmetric elements used, such as the kitchen window and kitchen table. The clear asymmetric glass window looks very unique yet stylish. It allows the natural sunlight to come into the spacious kitchen area so that it looks even more spacious. The grey color that dominates this kitchen is creating the futuristic look. The blurred kitchen cabinets are used in order to uniquely stored the kitchen utensils and tableware. The next idea of a futuristic kitchen is perfect for you who have a small kitchen area. It has a circle shape, the kitchen elements such as the sink, stove, and kitchen cabinets are closely placed to each other so that this kitchen is very practical. The householders have all the kitchen stuff they need around them. The attractive opened kitchen cabinets are installed so that it is easy to find the stuff needed. Moreover, the stainless steel material is used as the dominant material in order to accentuate the futuristic style. Being in this kitchen will make you feel like in a spacecraft. Look at the shape of the kitchen table. 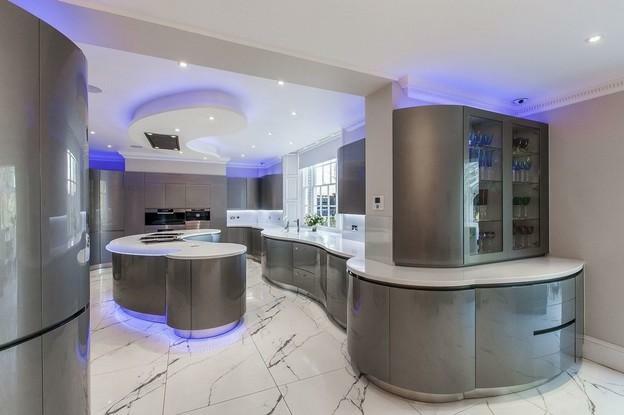 It is very unique and making the futuristic look even stronger in this kitchen. The householders only apply white and silver in order to maintain the modern and minimalist style. The blue hidden lights at the bottom of the kitchen table make this area looks more attractive and futuristic as well as those small lamps. The kitchen tools used are also very advanced. Moreover, the French windows and marble tile used for the kitchen floor blend very well with the other elements. 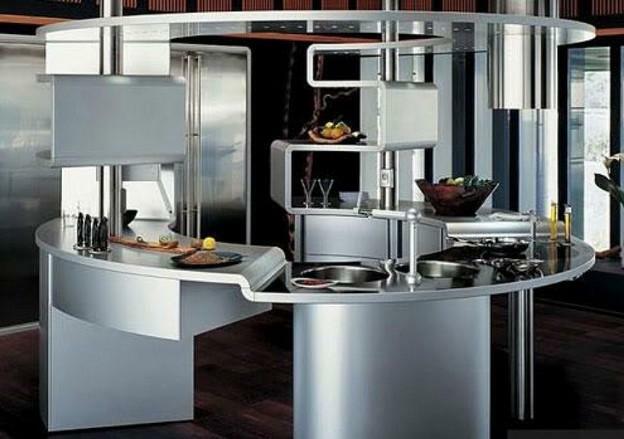 You do not have to always use silver in order to create a futuristic style kitchen. You can also use other colors such as blue, just like in the picture above. 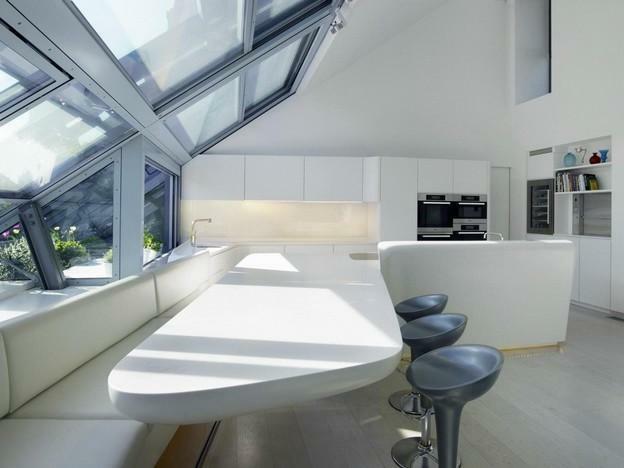 This kitchen still looks futuristic because of the attractive shaped kitchen table used. The wooden wall built-in kitchen cabinets do not even ruin the futuristic look, they even add colors so that the kitchen looks less boring. What makes this kitchen looks more attractive is because each kitchen tools such as stove and fridge are divided by the curved partitions. This kitchen area is not really large, but the big and clear glass window is able to make it looks more spacious. 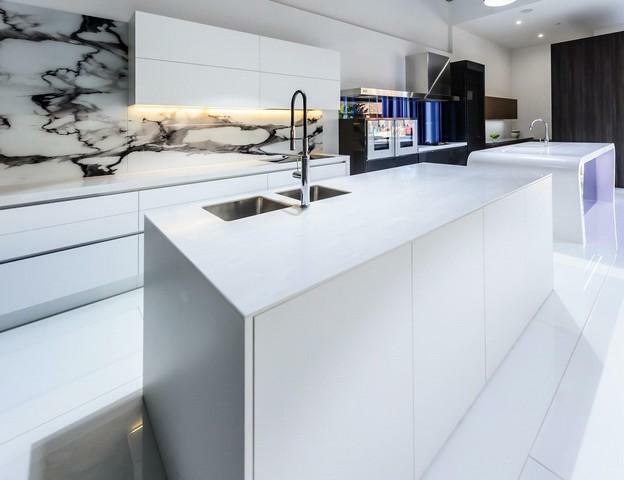 This futuristic style kitchen looks simple and minimalist because of the monochromatic colors used, which are black and white. The brownish grey kitchen wall is adding a color but it is still in the same tone so that it does not interrupt the minimalist look. 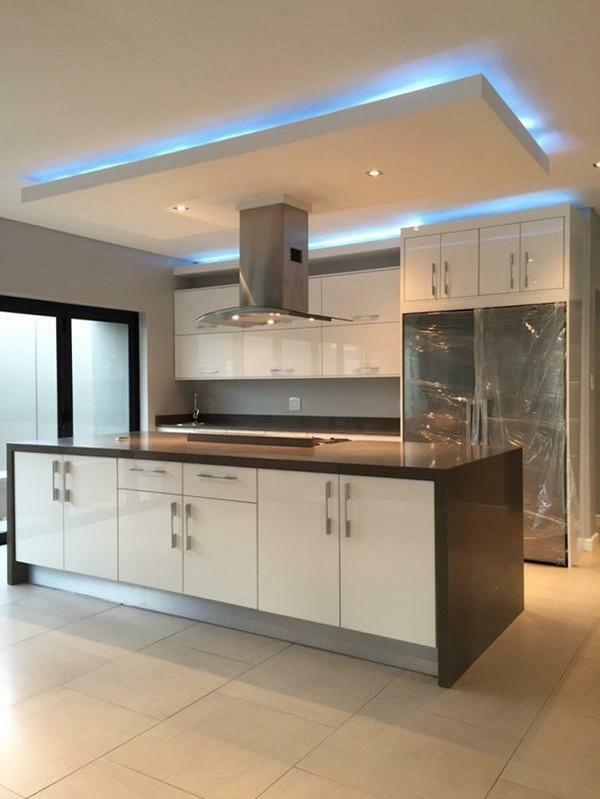 The modern cooker hood and hanging lamps make the modern futuristic style even more intense. A long rack is installed at the bottom of the wall-mounted kitchen cabinets so that the householders are able to place the washed dishes there. And the use of the floating dining table is a smart idea to save some spaces in the area. The ventilation in this futuristic kitchen is very great. The asymmetric clear glass window is not only making the area looks attractive, but also allowing the fresh air and sunlight come through the area. So that the kitchen area looks very bright. The floating dining table is used in order to save spaces in the area. The dining area is placed near the window, creating a comfortable place to have breakfast. Added with the long couch, it is able to accommodate a lot of people and make the dining area more comfortable. White is dominating in this kitchen area, making it looks very clean and bright at the same time. The patterned wall is used in order to add a pattern and make the kitchen looks less plain. The white wall mounted kitchen cabinets are installed above the kitchen table so that it makes it easy for the householders to take out some kitchen utensils or tableware during the cooking activity. The hidden lamps are installed at the bottom of the cabinets with the same purpose. The householders have 2 sinks, maybe to differentiate the area for washing dishes and washing hands. 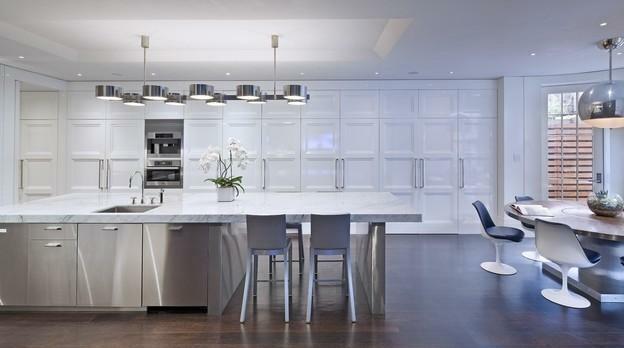 This kitchen is dominated by silver and stainless steel material. But surprisingly, it does not look boring. It is very attractive and unique instead. There are a lot of kitchen cabinets used so that the tableware and kitchen tools are able to be safely stored. This futuristic kitchen has 2 dining areas, the one is in the same area like the kitchen table, and the other one is placed not so far from the previous one. The dining area looks so futuristic because of the selection of dining table and dining chairs. The hanging lamps used are making the futuristic look even stronger. This kitchen has a warm atmosphere because of the dim lights and brown color used. The cooker hood is installed so that the kitchen area is free from smoke which is the result of the cooking activity. The black framed sliding door is able to connect to another room, and it is a great choice of door to save some spaces. Moreover, the blue hidden lamps above the wall built-in kitchen cabinets bring the futuristic look to the kitchen. Those are the inspirations of a futuristic kitchen for you who want to have a unique kitchen.